Our Redi-Stall toilet partitions are made from non-porous, hygienic Dupont™ Corian® solid surface material. These solid partitions are stain and mildew resistant, and will not rust, dent, or delaminate over time. In addition, they carry a Class 1 fire rating and are backed by a 15 year material warranty. PREMIUM SERIES - "THE CLEAN LOOK"
BOTH SERIES: Door Stop/Bumper shall be stainless steel type 304 with rubber bumpers to prevent damage to panel and pilaster. Integrally mounted. 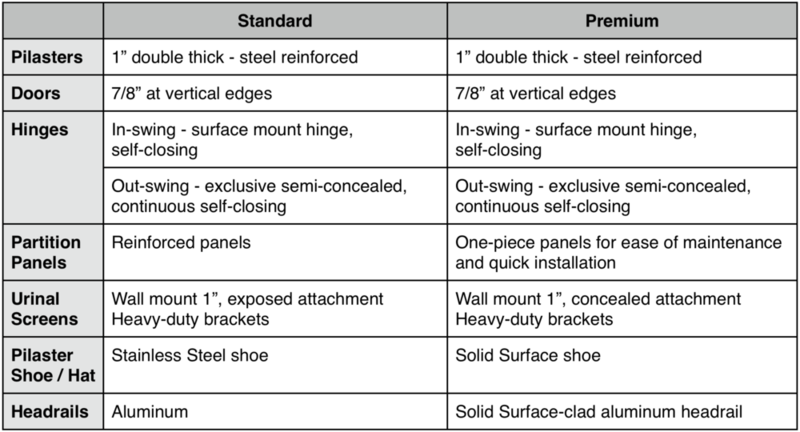 Sterling Surfaces Redi-Stall components are fabricated to standard sizes except where indicated. Architect or Owners representative MUST APPROVE shop drawings. Component edges shall have a smooth, uniform finish. Eased edge radius on all edges. Finish: “Sterling Surfaces Matte”. Other finish options available. After accepting delivered product, the contractor or installer assumes responsibility for the product. Installer must install components plumb and level, in accordance with approved shop drawings and specific installation instructions. All Care & Maintenance instructions and Warranty information shall be provided by Sterling Surfaces. Project Manager/ General Contractor shall convey to owners or their representative this information upon completion of project. Redi-Stall fabricated components are warranted against fabrication defects for 3 years. Warranty includes labor to remove or re-install replacements. Solid Surface material is warranted against material defect for 15 years. Hardware manufacturer guarantees product for 10 years.